“Last Call” ICOM IC-R75 Table Top HF Receiver : Yes, it’s true and is not a misprint (news as from a solid reliable source) , Icom has discontinued the IC-R75 HF receiver. It had a great 16 year run on the market. 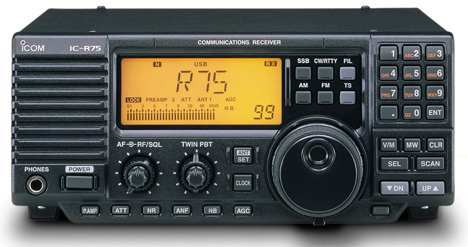 I would NOT look for Icom to replace the model. As I type this entry most US Icom dealers had limited remaining stock. But you can count on those to get slurped up fast !! So if you ever desired a NEW sample, you MUST do that NOW !! Only a few weeks ago, in my presentation at the Winter SWL Fest, I noted that the IC-R75’s days–as one of the last “legacy” tabletop receivers–were certainly numbered. Since the R75’s introduction, a lot of the receiver market has shifted to SDRs and SDR-based tabletops (like the CommRadio CR-1a). The IC-R75 must have one of the longest runs (with various iterations) of any tabletop receiver ever on the market–most impressive! Universal Radio has a special package price of $619.98 for the IC-R75 which includes the DSP option and Joe Carr’s antenna book and free shipping. Click here to view on Universal Radio’s website. This entry was posted in News, Radios, Shortwave Radio and tagged Dave Zantow (N9EWO), IC-R75, Icom, Icom IC-R75, Icom R-75, R75 on March 5, 2016 by Thomas.